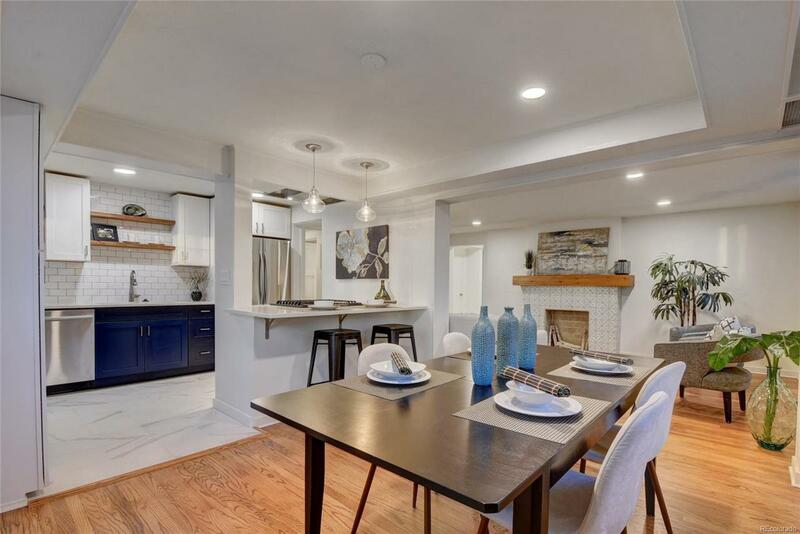 RARE find: Stunning Cherry Creek North condo - complete renovation an unbeatable location - blocks from all that CCN has to offer - best retail, restaurants, salons, coffee shops & more! Brand new open-concept kitchen with all new Stainless appl, Cabrini quartz countertops, gorgeous island, custom cedar open shelving, with dedicated pantry storage! This open floor plan has natural light throughout & custom fireplace! Refinished oak hardwoods, new kitchen/mud room matching tile, new carpet in beds. Master bedroom has 2 closets w/2nd bed perfect for guests or home office. Brand new bathroom features new lighting, new plumbing fixtures, subway tiles and new vanity. The building offers low maintenance living, community courtyard for your furry friends, shared laundry facility AND your own 1-car GARAGE w/1 add'l parking spot in front! Everything is brand new in this 2 bed/1 bath condo - perfect for a first time home buyer that won't sacrifice Location or Quality of Living! HURRY!